I know how important healthy sleep habits are. I gave birth to my oldest daughter a little over 4 years ago. 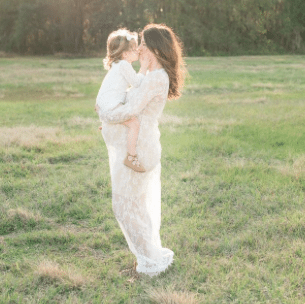 It was a beautiful birth (read about it here) and I was so proud to show off my beautiful baby girl. People are obsessed with sleep and love to ask you about it constantly when you have children. and it was a gauge for friends deep in the trenches like us. It really irked me when people asked me about my kids sleep, maybe because I wasn’t sleeping those first few years of motherhood and talking about it made me remember how truly tired I was. I really think people want to talk about sleep because it genuinely matters how much sleep we get as parents. I’ve had some sleepless nights and some nights where I sleep like that so called “baby” so I am here to share what info I have with you after 3 kids who were all very different sleepers. 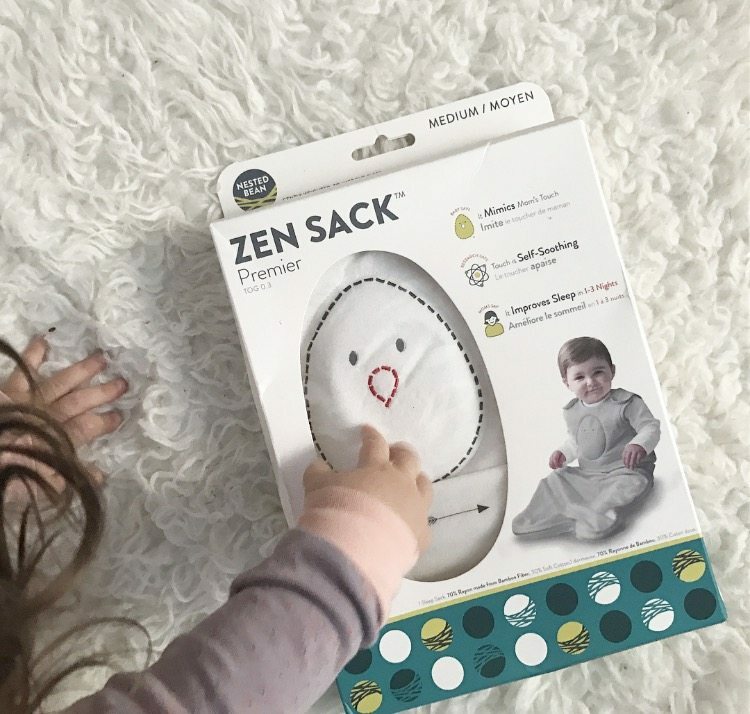 I have some go-to products like our Dockatot, organic Finn + Emma pjs, Nested Bean Sleep Sack, lovies from Slumberkins and Stella & Lu, and some great toddler items too. These items paired with some consistent routines have really changed the game for us and helped promote healthy sleep habits. I can’t wait to share what I have learned with all of you. Listen, I am no sleep expert… but today I get to introduce you to one! Everyone meet Lauren, Certified Baby and Toddler Sleep Consultant. Lauren has been helping families learn to love sleep over at Sleep and The City. She is here today to help us learn more about creating healthy sleep habits for our little ones. Sleep in The City is an amazing resource for every milestone, from pregnant moms suffering with insomnia, to a night waking infant, and even a toddler with nightmares! I was really blown away with Lauren’s extensive training and knowledge and her versatile approach. Lauren has been kind enough to share 9 tips to help you create healthy sleep habits for your little one tonight. I started implementing these as soon as she sent them to me. 1. First things first: if your child is not already in his/her crib or room all night, begin playing in room you desire them to sleep in ASAP, for at least 30 minutes per day. Nothing can be more alarming to a young child as waking up in an unfamiliar environment during the night or for a nap. Ideas for play for babies can be: Peek-a-boo, watching a mobile turn while lying in the crib, tummy time with a parent, or just observing the room in his/her crib while parent folds laundry within the same room. Ideas for play with toddlers: puzzles, art activities, building forts, decorating room with a new theme. If a child is more comfortable with their surroundings, and know that the place you wish them to sleep in a safe, happy & loving environment, they will be much happier to sleep in this room as well. 2. Make sure all caregivers are in agreement with your new routines or sleep plans- babysitters, daycares, Grandparents, nannies, etc. Everyone needs to be on the same page. 3. Review the sleep environment. I recommend a black out shade, portable low-rumbling white noise, humidifier for stuffy noses, and a security item (small lovey or animal). 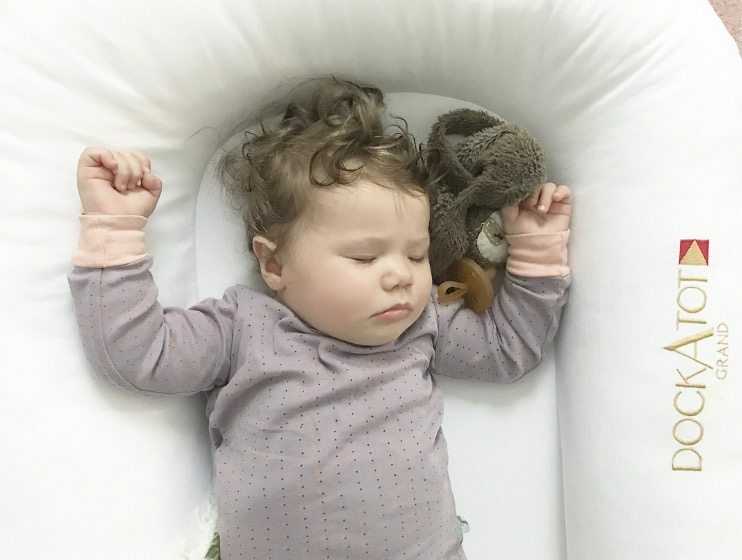 A Dock a Tot for children is a wonderful option for those parents whom wish to co-sleep the first few months with their children in the crib, or for older children transitioning out of a crib into a toddler bed. 5. Think about a bedtime routine that would work for you, and give it a shot tonight! Cues are so important when it comes to signaling the child that “it’s bedtime”. Ideal bedtime is between 6-8pm, so over the next few days, if you don’t already have an established bedtime, watch your child for fussy/sleep cues to determine when on average that natural window ends. 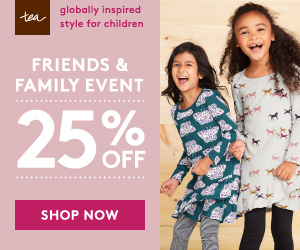 Choose some organic cotton pajamas such as those from Finn & Emma for children with sensitive skin. 6. Decide on the pacifier (if applicable). 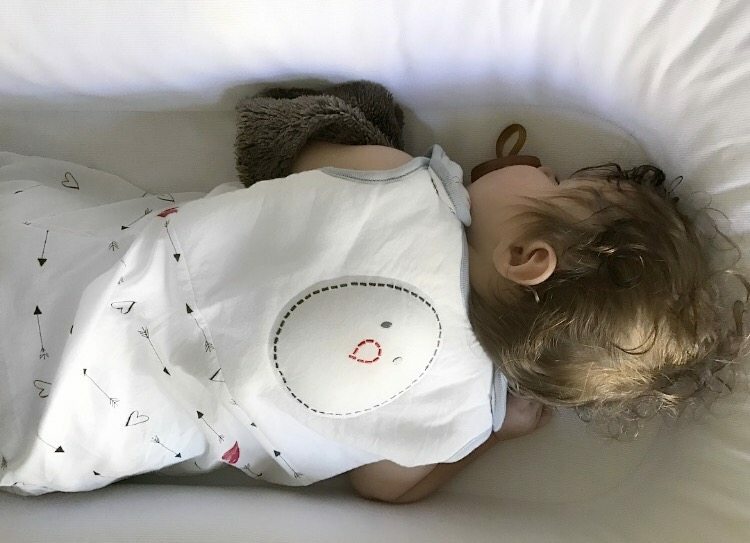 If your baby is over 6 months, you may want to ask yourself if this is a sleep crutch (great for soothing, but not great for “needing” it to sleep.) Can your child guide it back to his/her mouth? Have you had a conversation with your doctor about pacifier weaning? Are you having to run and re-plug the pacifier constantly to get baby back to sleep? 7. Get your child on a consistent wake-up time. Every day- not just M-F 😉 Ideal wakeup times for children are 6-7:30am. 8. Plan on about 3-4 weeks at home without traveling before beginning a new routine or working on healthy sleep habits. Consistency in routine & environment are two of the MOST important factors when a child is learning a new sleep skill, and if we don’t do the same thing in the same place as much as possible, this will prolong the negative sleep habits and issues. 9. 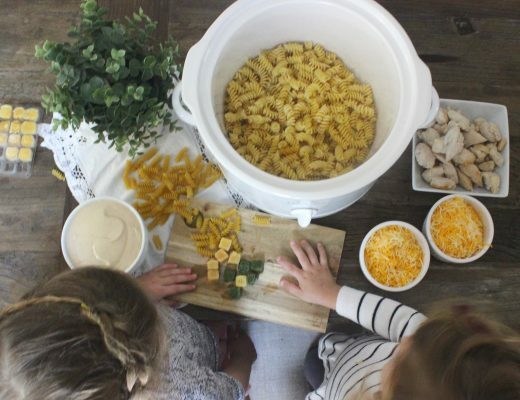 If not already, think about beginning an Eat-Play-Sleep routine, where the child will eat after waking for the morning, after each nap, and before bedtime (depending on age this will include 1-4 feeds/night). Use alternate soothing methods to help your child transition from play to sleep. *Remember to touch base with your pediatrician before starting any new routine. Ok so how great are these?!?! Some of these we were already doing in our home but I really love the journal we started after Lauren suggested it and implementing a wake up time so we can all start our day on that consistent routine. These are some great tips for starting to create healthly sleep habits. 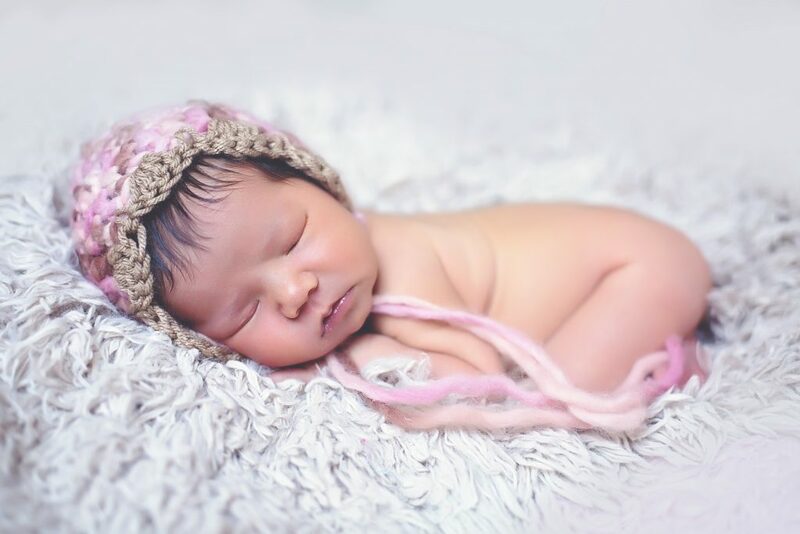 When Hazel, my youngest, was born (read her birth story here) I was terrified. My middle daughter was such a “difficult” sleeper. I wanted to equip myself with everything I needed to help Hazel get the best sleep possible and some sleep for mama too. That is why creating healthy sleep habits wows so important for us. 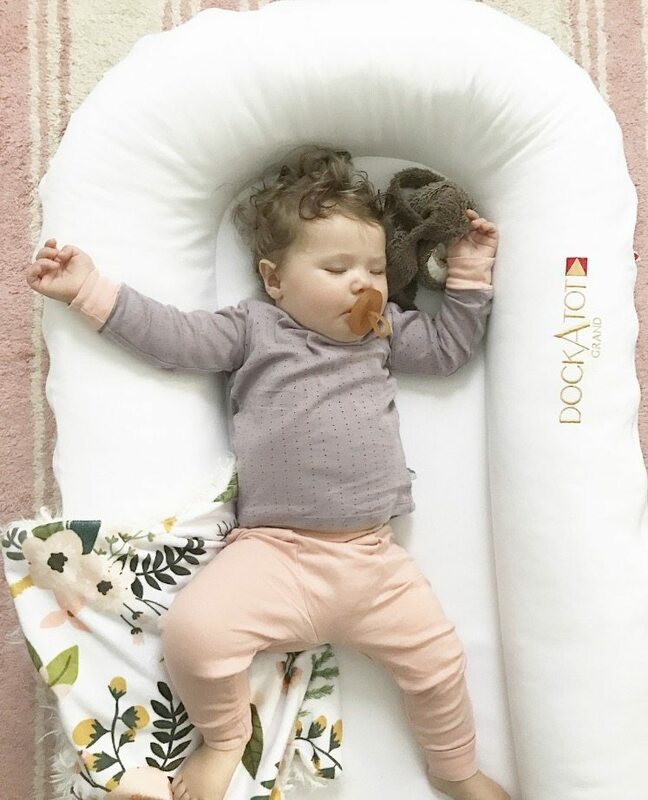 Lauren talks about consistency and that is exactly what the Dockatot provided for Hazel. No matter if she was in our bed at home or on vacation she always slept in the same spot. 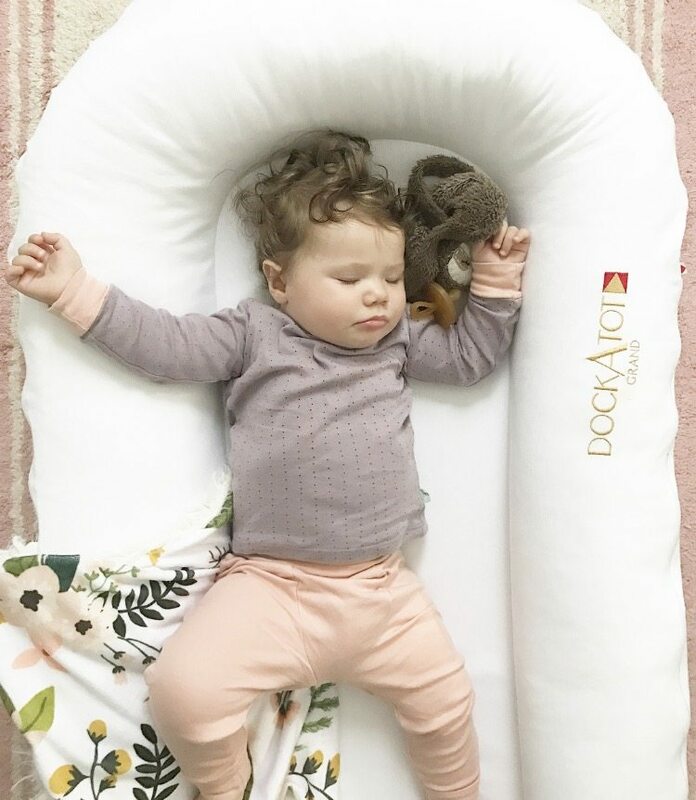 I also love how to Dockatot kept her snuggled, and I really believed the innovative design helped her feel secure and stay asleep longer. 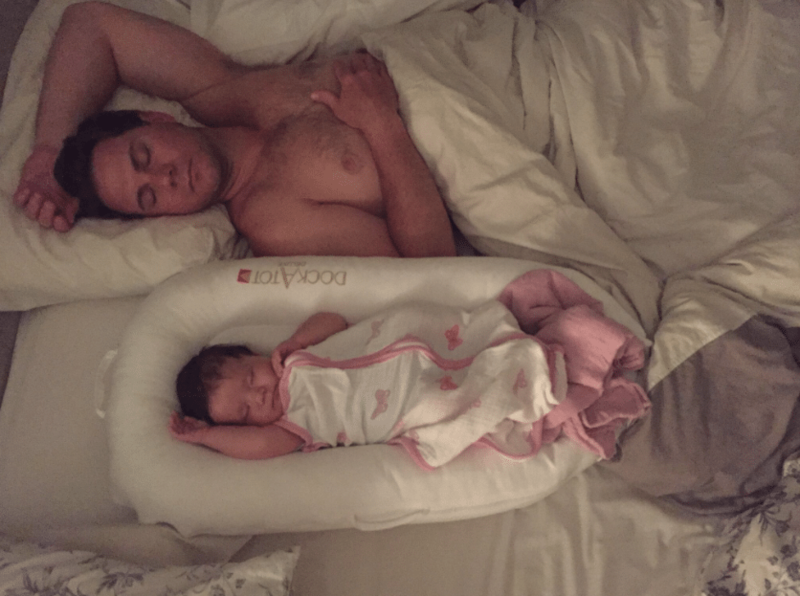 Those first few months Hazel slept in the Dockatot in our bed. I absolutely loved it. I loved the convenience of having her close by for nursing and that she was in her own secure bed. Even though I was waking to nurse I felt like I was getting so much more sleep. 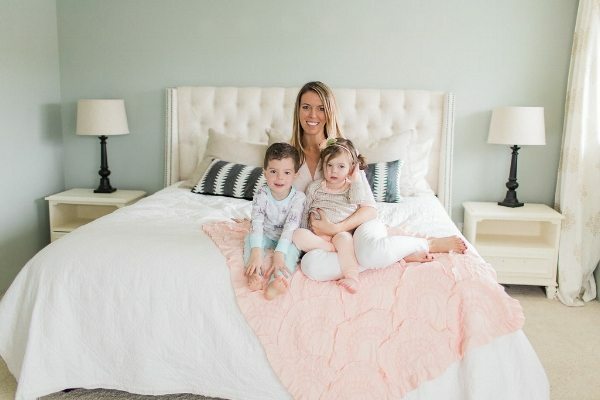 When I co-slept with my other two most of the time I kept them in a bassinet next to our bed because if they were sleeping next to me I couldn’t get that deep restful sleep I needed, I was too nervous. Seriously, if I had a Dockatot with my other two it would have been so much easier. Hazel stayed in our bed until she was 9 MONTHS, I just loved having her there and she slept great so I didn’t see any reason to move her. We were a little concerned that the transition to the crib would be difficult since she was so used to our bed but it was actually the opposite. Her bed never changed in her eyes and she slept great in her Dockatot, no matter where she was. We transitioned Hazel to the bigger version of the Dockatot, called the Grand, and she slept great. Now at 10 months Hazel is sleeping 13 hours straight. I didn’t have sleep like this with my other two at that age and I couldn’t be more thankful. 1. Between 6:45 and 7:15 we head upstairs for a bath. We generally let the big girls bathe together and usually have Hazel bathed before but on the days we are a little early we let them all play in the tub. We really focus on play during this time. We really want them to get that last bit on energy out. To promote a calm environment we diffuse our lavender essential oils and we even add it to the bath on nights we have a detox bath (read more about our detox bath here). 3. Once everyone is ready we all get snuggled up for some books. Not only is reading great for your child’s brain development but it is the perfect activity to get them calm for the night. As you can see I have a reoccurring theme here, it’s all about getting them calm before bed. It’s hard to wind down after an action packed day so it takes time to calm their bodies and their mind. If you incorporate calm activities throughout the night when it comes to actually falling asleep it will be a much smoother process. 4. If your toddler is constantly asking for more when it comes to bed time create a checklist that you can do together. My girls (who share a room, 4yo and 2.5yo) and I have the same things we do every night. Creating the stage for healthy sleep habits. We get into bed (by the way they love saying “check” and making the motion with their fingers), turn off the lights and turn the nightlight on, turn on the sound machine, have a sip of water (why does every toddler feel like they are going to die of thirst right before bed?? ), get tucked in, a kiss to mommy, a kiss to their lovie, a little pixie dust (that i magically pull out of pocket to promote good dreams), a little monster spray as I walk towards the door (just some diluted essential oils that promote sleep in a spray bottle), and then I blow a kiss as I walk out. They have control of the checklist and we have both agreed that once we complete the checklist then I leave and I stay consistent with that. It might take some time but this process worked wonderfully for us when we tried to cut down on the millions of questions before bed. 5. Hazels bedtime routine is mostly the same but obviously a few differences because of her age (10 months). After books I take her into her own room. It is dark with the sound machine. I nurse her until I notice that she has started to fall asleep but not completely. I quickly unlatch and replace with the natursutten pacifier and rock her for a few minutes before I put her to bed. Some times she is not completely asleep and a little restless but I let her soothe for a few minutes. If she cries I come back in but usually she is able to put herself back to sleep. I am always thinking about the healthy sleep habits I am creating. Each of my girls have a lovie and I feel like the security a lovie provides gives them the confidence to fall asleep especially when mommy and daddy aren’t around. My oldest has a Wubanub that does not have a pacifier, it’s just a little stuffed elephant that she has slept with since the day she was born. My middle has a stuffed lamb and my youngest has a sloth from Slumberkins and a lovie blanket from Stella & Lu. Recently we came across the Nested Bean. It is a sleep sack with a weighted pad to simulate a parents touch. It is beautifully made, soft and lightweight which is perfect for Florida nights. Since Hazel sleeps on her tummy most times we put the weighted piece on her back. I noticed since we incorporated wearing the Nested Bean during naps she settles quicker and stays asleep longer. 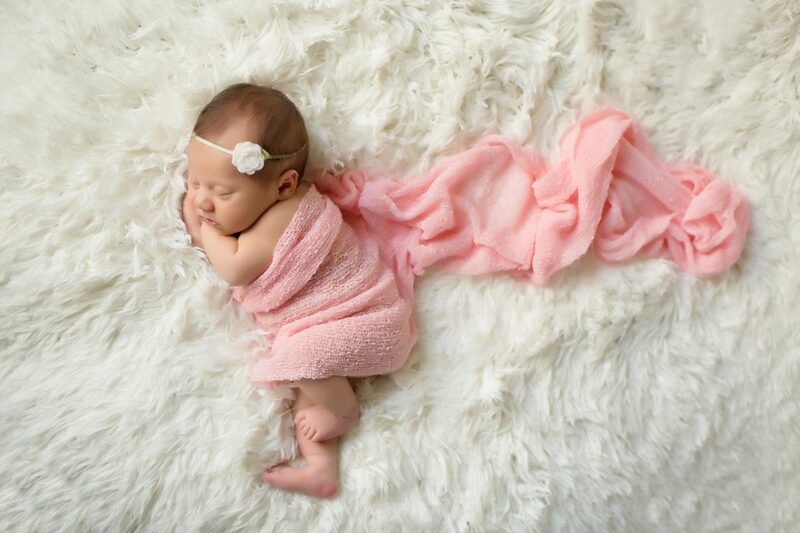 If you have a little one who only wants to sleep in your arms I would suggest trying the Nested Bean. I hope taking a glimpse into our nightly routine can give you some new ideas if you and your family are needing help getting some more sleep in your home. That with the tips from Sleep and The City and the amazing products my family uses you can arm yourself with the tools to get your family a betters night sleep, even starting tonight. These healthy sleep habits are so important to us and I hope they can help your family. Do you incorporate a routine to help promote healthy sleep habits? 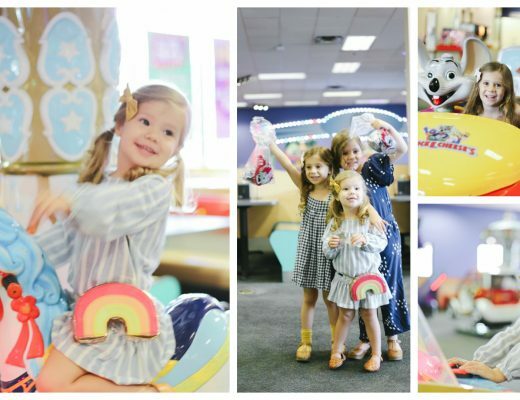 Have any useful tips to share with other moms? Have questions about your difficult situation? Comment below, I would love to hear from you. The Gray Ruby Diaries occasionally receives free products and payment to feature items on this site. I take a lot of pride in endorsing products I love. I hope you trust that I would never let that get in the way of sharing my personal opinions with you. Thank you again for reading about how to create healthy sleep habits. I hope by sharing my experiences you can take away little pieces to make your life easier and happier! Pediatric Telemedicine – Is it the right choice for your family?